Collect a your own set of unique Eleminis to win! Eleminis are little elemental characters, Air, Water, Rock, Fire and Plant. They each have their own special strength over two other Eleminis. For instance, Plant swallows Water and Air. There are also special super-powered Eleminis, the sensational Star, and the terrible Trash, and Action cards featuring the peculiar Arrow characters. The game is very easy to play and has plenty of "take-that" fun! 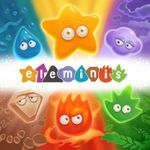 Eleminis is fast playing family card game that kids and families will love, and a colorful game that anyone can enjoy.